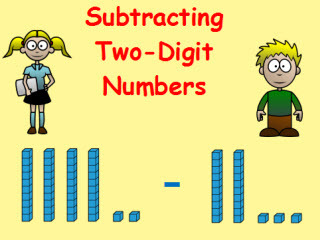 In this test, 2nd grade students will practice subtracting different two-digit numbers by employing a variety of strategies such as: using models to regroup and find differences, writing subtraction problems vertically, and using addition to check the answer of a subtraction problem. This quiz has ten problems: six multiple choice, three drag and drop items, and one matching problem. Second grade students will use place value and properties of operations to subtract two-digit numbers (with and without regrouping.) Some problems are written horizontally, some vertically, and one problem has a model with base ten blocks. Add and subtract within 1000, using concrete models or drawings and strategies based on place value, properties of operations, and/or the relationship between addition and subtraction; relate the strategy to a written method. Return from this Subtracting Two-Digit Numbers to the Elementary Math Tests , 2nd Grade Math Tests webpage, or to Math Tests.